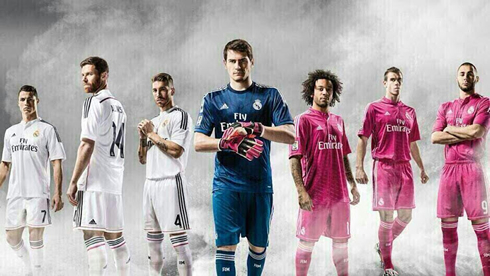 ﻿ Real Madrid new jerseys for the 2014-2015 season: White and Pink kits! 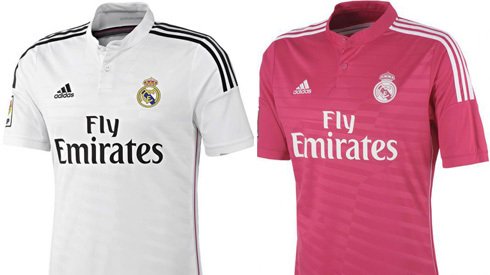 03.06.2014 » Real Madrid new jerseys for the 2014-15 season: White and Pink kits! 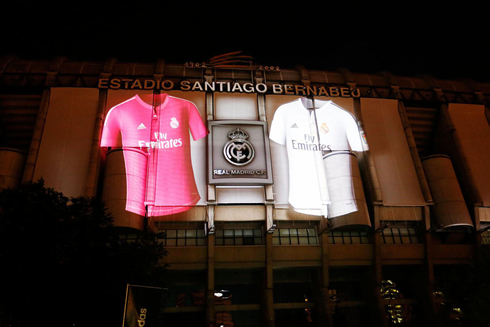 This past Monday night, Real Madrid and Adidas presented the club's new jerseys for 2014-15, through a spectacular "mapping" show delivered at the main facade of the Santiago Bernabéu, right in front of the Plaza Castellana. 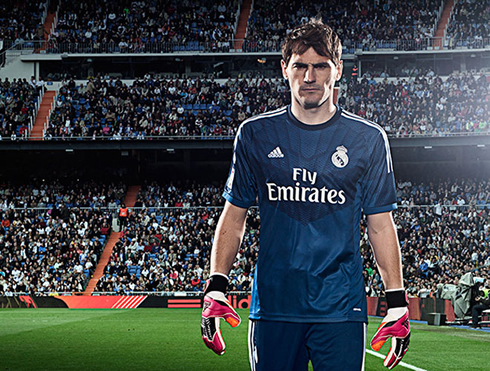 The main jersey will be very similar to what we've seen in past years, but it's the away jersey that is sure to leave no one indifferent. 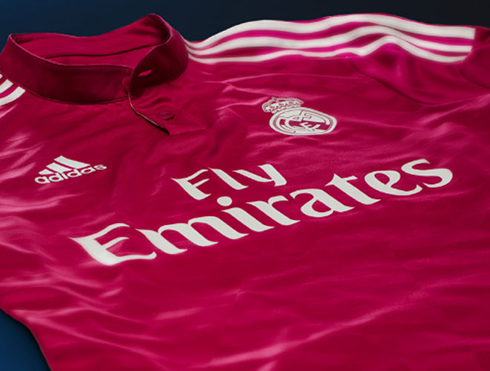 Real Madrid's marketing team made a bold decision by picking pink as the color tone for the secondary shirts next season and it didn't take long for several people in Spain to start criticizing the change. 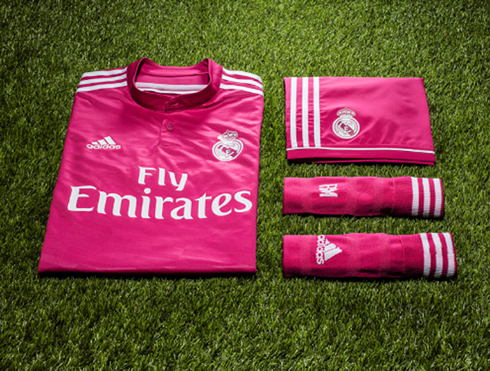 In 112 years of club history, this will be the first time that Real Madrid will wear pink when they step on to the pitch in order to literally defend the club's colors. The whole marketing campaign was curiously called "Wear it or fear it!" 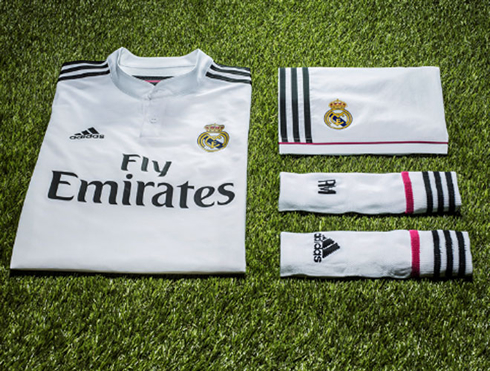 The magnitude of the ceremony and event where these new kits were presented this Monday (June 2), somehow suggest us that Real Madrid and Adidas are highly confident in the success of this strategical marketing play. 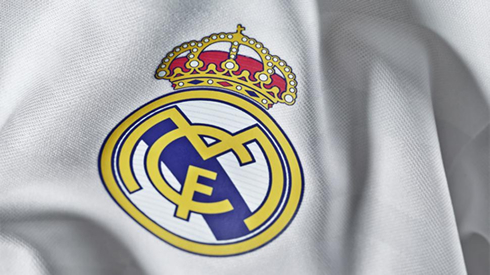 The two brands are currently linked together through a sponsorship contract until 2020, in a deal that entitles Real Madrid to earn close to 32 million euros per year (43.5 million US dollars). 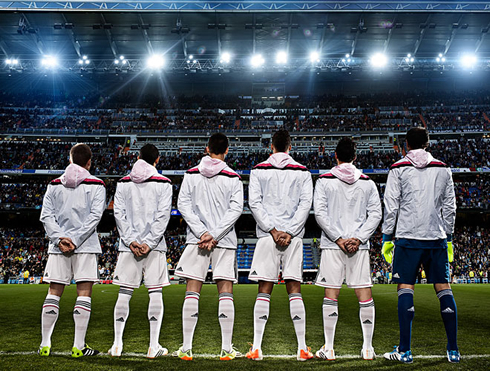 With the sports market becoming more competitive year after year, the Merengues are certainly aware that they are one of Adidas' most valuable and esteemed clients in the football industry. 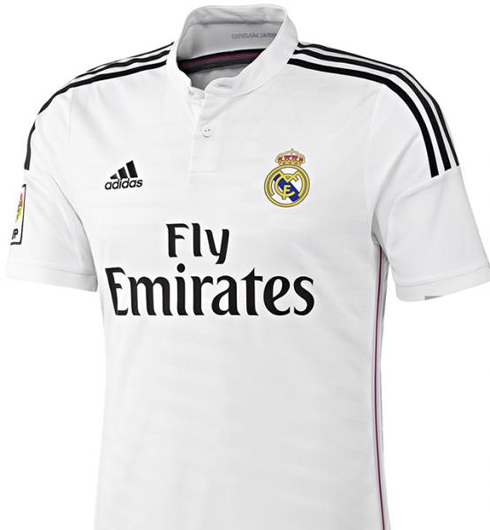 The new Real Madrid main white jersey won't change much from the version we've had this season and the versions we've had in previous years. 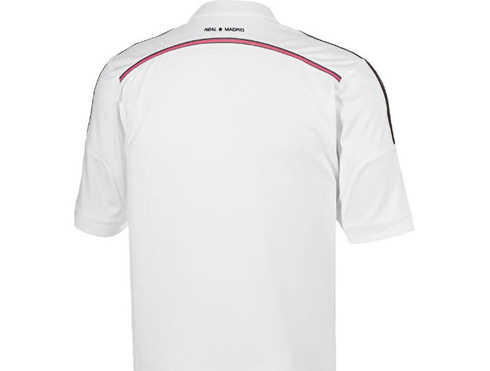 The orange stripes that were located around the neck, on the end of the slieves and on the sides of the jersey are completely stripped off and only these last ones are actually replaced by a dark pink line, which appears again on the back of the shirt. 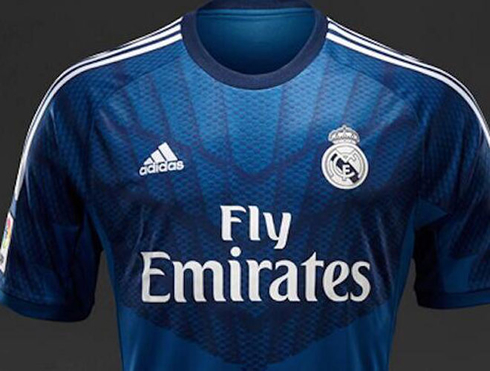 Apart from that, the new Real Madrid main jersey for 2014-15 will be filled only with black stripes and a prevalent white color tone. 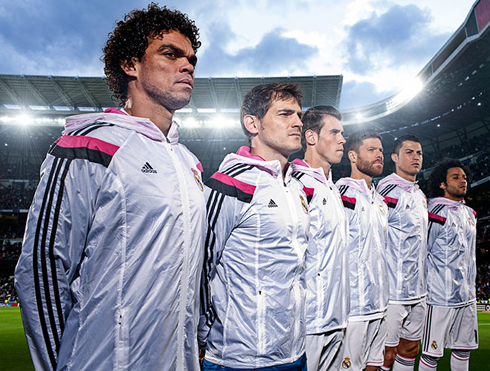 As for the Real Madrid away jersey for 2014-15, it basically didn't keep many details from the last season's version. 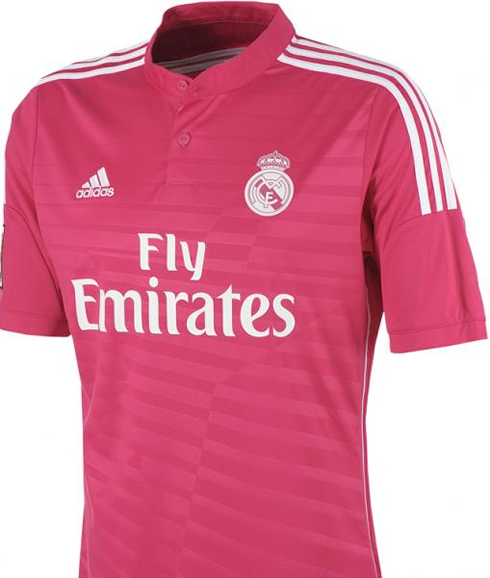 It's now filled with a vibrant and living pink color tone, only interrupted by white stripes and the mandatory text inscriptions. 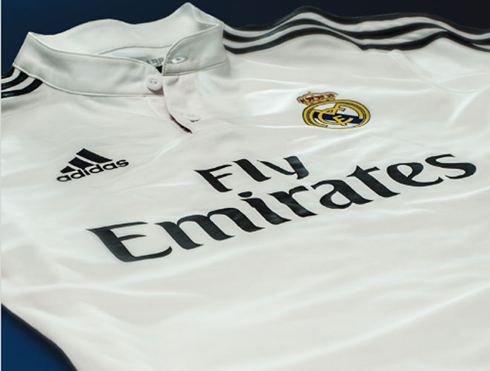 One more detail that stands out in both these new Real Madrid home and away jerseys is that both kits were now given a button-down collar design, which is also quite unusual in previous seasons' Real Madrid shirts. 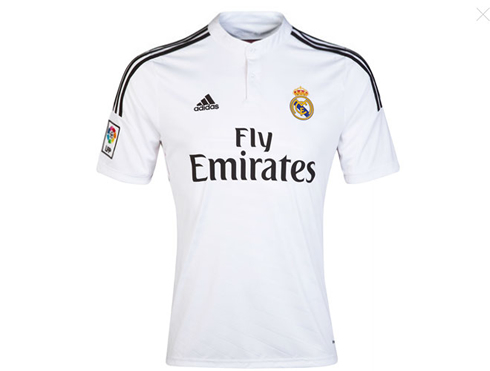 For those of you thinking about where to order/buy any of these Real Madrid new jerseys online, you can purchase them through our trusted partners from SoccerBox. Cristiano Ronaldo next game will be an international friendly for Portugal against Mexico, scheduled for June 6 of 2014, in Boston. You can watch Juventus live stream, Mexico vs Portugal, Italy vs Luxembourg, Ecuador vs England, and Argentina vs Trinidad and Tobago, all matches provided from our soccer streaming pages.